We ate a lot on our vacation. We ate and ate and ate. But even we need a break sometimes. When we were planning our vacation, David tasked me with the specific request to find things to do that were not edible or imbibe-able. Louisville has a lot to offer, and with a little research, I had a list drawn up of places for us to go where we wouldn't be stuffing our faces. You'll see plenty of food in the posts to come, I promise. But in case you are in the same boat in Louisville, this post might help you out. We stayed in the 21C Hotel in the CBD downtown, which was an experience in itself. The hotel is also an art museum, featuring mixed media, photographs, sculpture, paintings and many other exhibits that is free and open to the public. We spend a good amount of time wandering around there and moving the large red plastic penguins around the hotel. 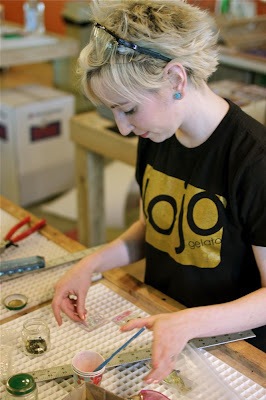 Around the corner from 21C is Louisville Glassworks, a studio that offers classes, and also the less intensive "walk in workshop" where you can create a variety of fused glass projects. I liked the studio--the staff showed you the materials, answered your questions, but otherwise left you alone to work. David and I worked together to make a fused glass plate, and I made a few pendants with dichroic glass. Once fired, Glassworks will ship your work to you in a large box with lots of bubble wrap to keep it safe. We visited the Science Center, across the street from our hotel. This would be a great place to take little kids. There were lots of parents and children running around there. I instructed David to touch as little as possible. We were not getting sick on vacation. And yes, there is the Muhammad Ali center, and the Louisville slugger museum. We waved at those as we passed them by. David and I have a crippling lack of interest in sports. It's why we always lose at trivia. We made a point to visit Churchill downs and the Kentucky derby museum on Friday to see the 2010 Clark Handicap, a grade 1 stakes race. I was a bit of a horse nut when I was younger, and I still am. There are no pictures of the derby museum because I was too busy excitedly dragging David from exhibit to exhibit. We made sure to get plenty of pictures the races. We had placed our bets on the entrants in the Clark earlier in the afternoon. David bet on a long shot, Giant Oak, because he liked the name. I thought I had it all figured out. I had done my research. I even went so far as to bet it all on my favorite to win. but the chestnut bay finished lengths ahead. Imagine my surprise when David's horse came in second, and later winning by a technicality due to the "winner", Successful Dan (the favorite, odds wise) getting all handsy in the home stretch and being disqualified. It's a duel down the stretch! Sounds like a great trip. Isn't the 21C a delight? Gotta love those red penguins. I'm so hoping their hotel in Cincinnati will still happen. On a trip to Louisville last March a friend and I visited 21C, although we didn't stay there. Eating at the hotel's restaurant, Proof, is definitely on the agenda for the next visit. And we may have to go to Capriole too - thanks for the great report on it, too!